The big-hitting trio of Meraas, Caesars Entertainment and multi-Michelin-starred chef Gordon Ramsay put on a spectacular show on March 18 for the exclusive launch of Caesars Bluewaters Dubai for VIP guests as well as local and international media. Introducing the first non-gaming resort from the legendary Caesars Entertainment brand, the evening also marked the sizzling debut of the second global outpost of Gordon Ramsay Hell's Kitchen. 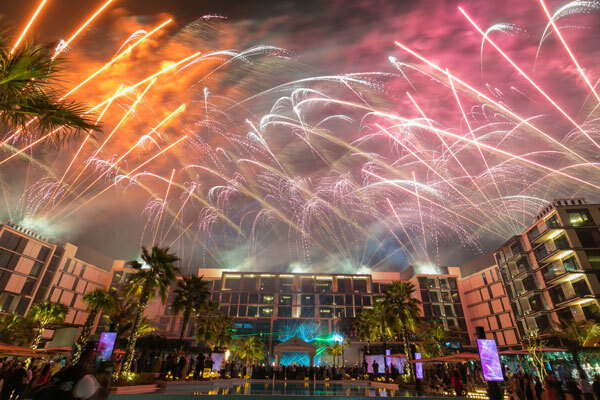 The successful, glitzy grand launch was hosted by the multi-Michelin-starred chef and members of Las Vegas’ Caesars Entertainment team, including executive vice president and chief marketing officer, Chris Holdren, and concluded with an incandescent firework display. Holdren commented: “It is with great honour that Caesars celebrates the Grand Opening of Caesars Bluewaters Dubai with our partners at Meraas and our global dining partner, chef Gordon Ramsay." “This fantastic resort complex perfectly represents Caesars’ legacy of excellence in hospitality and entertainment, personified by chef Ramsay, combined with Meraas’ vision for a luxury resort anchoring Bluewaters, which will undoubtedly become yet another iconic Dubai landmark,” he added. Located on Bluewaters, Meraas’ sophisticated modern, family-oriented island destination, Caesars Bluewaters Dubai will be surrounded by nearly 150 retail, dining and entertainment outlets. And standing at over 250 meters on the edge of the island is the world’s largest observation wheel, Ain Dubai, which serves as a spectacular focal point and can be seen from both hotels and the residences. Bluewaters is easily located from the mainland with a new pedestrian bridge spreading out over the crystal waters of the Arabian Gulf leading directly from The Beach to the island. The night got into full swing with a ‘Caesars and Cleo’ procession welcoming guests to the grand launch event, followed by a red carpet buzzing with Dubai’s movers and shakers. Fire dancers and acrobats dazzled the attendees in true Caesars fashion, while performers from award-winning entertainment sensation “WOW” delighted onlookers with acrobatic feats from the show currently running at Caesars Bluewaters Dubai’s entertainment destination, The Rotunda.